Michael Adebowale and Michael Adebolajo were found guilty of murder yesterday at the Old Bailey for the killing of Fusilier Lee Rigby last May in Woolwich. 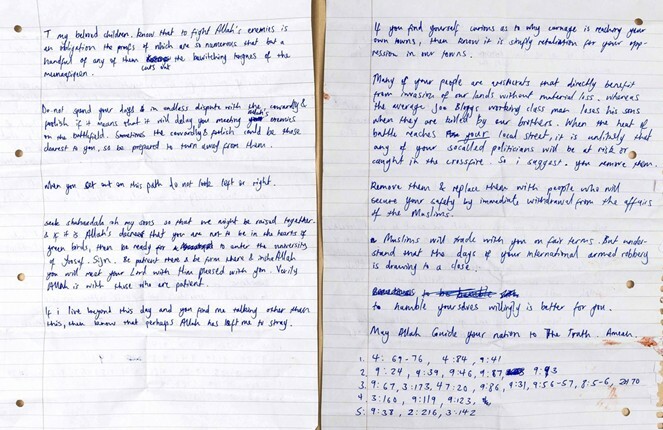 Bloodstained notes written by Michael Adebolajo were used as evidence in the trial. The references to the Koran at the bottom of the notes include numerous exhortations to be obedient, to fight in the way of Allah, to “Fight those of the disbelievers who are near to you, and let them find harshness in you” (9:123), and to “fight the minions of the devil” (4:76). They also include a verse directed specifically against Christians (9:31). Adebolajo is reported to have given a passerby a handwritten note at the scene of the crime. You’ll notice the references at the end of the note to verses in the Koran. The verses are reproduced them below in the order Adebolajo, a.k.a. Mujahid Abu Hamza, has them at the bottom of his “manifesto” (I have used Marmaduke Pickthall’s translation which is, I believe, in the public domain and is freely available on the internet). Group 1: 4:69-76, 4:84, 9:41. 5 Even as thy Lord caused thee (Muhammad) to go forth from thy home with the Truth, and lo! a party of the believers were averse (to it). This entry was posted in Counterjihad, Domestic terrorism, Enrichment, Legal action, Sharia, UK by Baron Bodissey. Bookmark the permalink. Remember what David Cameron said. My name is David Cameron and I can categorically state that this murder has nothing whatsoever to do with islam. There are 650ish MPs who usually never miss a opportunity to call each other liars and so far as I can remember not one challenged this total inversion of the truth. I have no idea how many journalists there are, and none of them seemed to want to challenge his assertion either. Remember the words of that all knowing Prime Minister, Mr Cameron:….”This has nothing whatsoever to do with Islam”. Farmer Giles did not move the boundary stone, as I live and breath! I didnt use my influence to secure a council house in Westminster for cousin Tarquin! Remember also what was said by Boris Johnson. And Nick Clegg. A Prime Minister with a spine would have used the opportunity given by this gruesome crime to make a statement. These two should have been charged with treason as well as murder. They should be charged with treason now. And neither of them should ever see the light of day again. Not even from behind glass. Also, they should be put somewhere where it is impossible to tell in which direction Mecca lies. Well they already changed direction once. The police should have shot and killed these two when they arrived on the scene. The police were confronted by a murderer armed with a pistol and another murderer with a large knife, who ran straight at them. The mutilated body of their victim lying yards away: yet they shot to wound! There is then a trial, at which they plead not guilty. This despite one of them being filmed at great length explaining why they carried out the murder. This trial forced the family of Lee Rigby to be put through a terrible ordeal. Yet it also allowed one of the muslim terrorists to attempt to justify himself and propagandize islam. They were unsurprisingly found guilty and will now be held, at great expense, for the next 20-30 years. They will recruit more muslims in prison and in all likelihood will be extremely difficult prisoners to deal with, as one of them showed when he was being held on remand. The police could have prevented all this; if they’d done what 85% of the population of this country wish they had done. I wonder if these two would be alive today, if those armed police had arrived and they had been confronted by the body of a uniformed policeman who had been hacked to death in the middle of the street? It was rather strange how they ran quickly to get the old first aid routine going, after they plugged him. I’d have let the [epithet] bleed out in the street, myself. What sort of guidelines were they following anyway? Surely if an armed assailant is not dead, you keep shooting until you are sure he is dead, and poses absolutely no threat whatsoever? Remember the SAS guys in Gib, they emptied their clips into those IRA toerags. No first aid there eh. In 2010, Adebolajo was arrested in Kenya with five others. He travelled using a British passport in the name Michael Olemendis Ndemolajo. He was released to British authorities in Kenya and deported. The British Foreign Office confirmed “a British national was arrested in Kenya in 2010” was given consular assistance. No charges were filed against Adebolajo. Why isn’t Paul Wilders jumping all over this & connecting the rather “ominous” reading material of Lee Rigby’s murderers to their eventual actions? Once people convert to Islam, we should never use their given birth names. Such as Michael Adebowale and Michael Adebolajo – “Michael” means “who is like God”. These creatures certainly aren’t!!! And also “”Allahu Akbar” really means “Allah is greater” (than?) or some say it translates “Allah is the greatest”.